This was a simple question with an interesting answer, but also a case of continuing after the patron had left just for my own entertainment. "Be patient, and give your eyes plenty of time to adapt to the darkness. The direction to watch is not necessarily toward Perseus but wherever your sky is darkest, probably straight up." Even with there being no moon, the patron was still wasn't sure if our area would be dark enough. Chelmsford is somewhat rural, but not too far from a few large urban areas, and I really didn't know how much their lights would affect us. I was hoping someone had done some kind of light pollution map mashup, creating a tool that let us zoom right into this area to see how much light pollution would affect us. So, I did a hopeful search for "light pollution map" and the first result was exactly what I was looking for. The Dark Sky Finder is a Google Map superimposed with light pollution data, and we were both surprised to see how illuminated our area is. However, it gave the patron some ideas on where to go, so he was happy. Matching up the red areas on the light pollution map to the blue areas on the election results maps produces only one obvious conclusion: Democrats cause light pollution. This was an interesting question, but what impressed me most was my own ethnocentrism. A patron came to the desk, asking for help in locating the Statue of Foundation of Tenochtitlan. The statue commemorates the initial founding of Tenochtitlan by the Aztecs, which later grew into Mexico City - so, a fairly significant statue. He said he knew it was in Mexico City, but he wanted to know the exact location, so he could visit it when he went there. He said he had been looking for days online, but was coming up empty. My first thoughts were to search online and also check our Mexico travel books. Since he was convinced there was nothing available online, we walked down to the 917's and started checking the indexes of all our guide books. We checked under Statue, Foundation, and Tenochtitlan, and found nothing - really, nothing at all, except Tenochtitlan entries referring to the Aztec ruins sites. At this point I began to question whether he had the name correct. We came back to the desk and searched on Statue of Foundation of Tenochtitlan, which lead to a Wikipedia photo of the statue - so it seemed he had the name right. A few other flickr photos came up too, and I checked them all hoping they would be geotagged, and we could find it on a map that way, but no such luck. I tried a few more searches, all the while with the patron saying he tried the same thing and saw the same unhelpful websites. I could tell he was getting antsy and frustrated, so I told him I could take his name and number and keep looking, and I'd contact him when I found something. He was happy with that, and was appreciative when he left. The rest of the day was very busy, so I could only search in bits and pieces as I had time. However, driving to work the next morning, it suddenly struck me why we couldn't find anything: we had been searching with English words for a Spanish-language phrase. When I got to work I put my (obvious and long-overdue) breakthrough into action, translating from English to Spanish, and then searching on Estatua de la Fundación de Tenochtitlan. Reading through (as best I could) those results, I noticed most websites refered to it as "Monumento" rather than "Estatua," so I did a new search for Monumento a la Fundación de Gran Tenochtitlan. Al oriente de la plaza, el Palacio Nacional, construido sobre las ruinas del Palacio de Moctezuma. Al sureste de la Plaza el edificio de la Suprema Corte de Justicia que anteriormente fue el Mercado del Volador, es la sede del poder judicial. Frente a la Suprema Corte de Justicia, el interesante monumento que rememora la Fundación de la Gran Tenochtitlan. East of the plaza, the Palacio Nacional, built on the ruins of the Palace of Montezuma. Southeast of the Plaza building of the Supreme Court formerly the Mercado del Volador, is the seat of the judiciary. Faced with the Supreme Court, an interesting monument which commemorates the founding of the Great Tenochtitlan. That seemed like enough to go on, so I searched Google Maps for Palacio Nacional Mexico City, then looked Southeastish to find the Supreme Court building, and then zoomed in as far as I could and looked around the streets for the Monument. I found the likely spot and switched to Google Street View to verify - and it was it. I called the patron, he gave me his email address, and I emailed him the link to the monument's location. Oddly, I looked in our Mexico travel books under Monumento, Fundación, and even Estatua, but this statue doesn't seem to be included in any of them. The funny thing is that, Mexico had never really been on my places to visit, but now I'd really like to go there. And for those keeping track, behold, more evidence that the internet doesn't mean the end of libraries. Not only is everything not on the internet, but even when it is, not everyone can find it. When I upload photos to flickr, I always try to place them on the map, if appropriate. When I started a flickr account for my library, I noticed that there was a problem with the map. I work at the library in the town of Chelmsford, MA, which is situated right next door to the city of Lowell, MA. Lowell is much bigger, and if it had a "metro area," Chelmsford would be a part of it. However, after having lived her for a couple years, I know that the two communities are very different. High school rivalries, traffic problems - heck, I even hear Chelmsford library patrons complain about Lowell patrons and the Lowell library. Community loyalty here runs as deep as the Merrimack River. 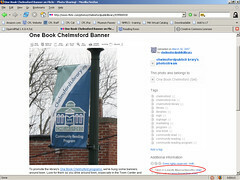 So, I was sort of startled to see flickr claiming that all the photos mapped for the library's account (which were taken in Chelmsford) were listed by flickr as "Taken in Lowell, Massachusetts" (as circled in red in the photo above). We are aware that there are some locations that might be reflecting an adjacent city or town, or an incorrect place name. In some cases a place name might reflect a town name that is no longer in use. Flickr uses map data from Yahoo! which in turn is provided by third party providers (most online maps you see are sourced this way). We are developing methods to allow you, the knowledgeable member, to be able to contribute to local adjustments. We don't have a particular date in mind when we would be able to offer this, but please understand it is something we hope to provide in the very near future. Not exactly the "hi, we're flickr, and we can do anything" kind of response I was hoping for, but I do understand the issue. I guess I just have to hold on until this feature becomes available, and explain to our patrons why it looks like the Chelmsford Library is actually in the city next door.